Why not surprise that special woman in your life by making her a delicious meal this Sunday with the help of our Head Chef’s slow-cooked lamb recipe? Or, if something sweet is more her thing, our lemon and violet drizzle cake is guaranteed to hit the spot. Season the lamb well and sprinkle over the cinnamon. Cover tightly with foil and place in the oven. Immediately reduce the oven temperature to 150C/130C fan/gas 2. Leave to cook for 4 hours, skimming the fat from the juices and removing the foil for the final 30 mins of cooking. After 1 hour, put the potato wedges in a large roasting tin, coat them in 4 tbsp olive oil and season well. Roast in the oven with the lamb for 1.5-2 hours. 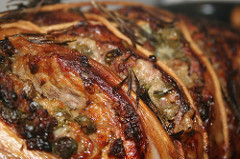 Transfer the cooked lamb to a large piece of foil, wrap tightly and leave to rest for 20-30 mins. Check the potatoes are cooked (if you need to, turn the oven up to 220C/200C fan/gas 7 to finish cooking). Add the olives and wine to the pan juices, simmer them and keep warm until ready to carve. Serve the lamb thickly sliced with the olives, potatoes and a tahini & lemon sauce such as this one: http://www.bbcgoodfood.com/recipes/tahini-lemon-sauce, with the meat juices poured over at the last minute. Preheat the oven to 180C/Gas 4/fan oven 160C. Butter and line the base of a shallow oblong tin (about 18x28cm/7x11in) with baking parchment. Tip all the cake ingredients into a large mixing bowl and beat for 2-3 minutes until the mixture drops easily off the spoon. Spoon the mixture into the tin and smooth the surface with the back of the spoon. Bake for 30-40 minutes until golden and firm to the touch. Meanwhile, make the icing: beat together the lemon juice and sugar, pour the mixture evenly over the cake while it is still hot, then leave to cool. Cut the cake into 15 squares. Top each one with a crystallized violet and mimosa ball.